I loved my Wii U, but the expectation never lived up to the reality. It was the first ever HD Nintendo console, and one that I could play HD Mario with handheld mode. Absolutely mindblowing concept back in 2012, quite honestly, so it was very easy to get swept up in it all. But it’s been a gradual process to get to this point and let’s be honest with ourselves, without the experimentation of the Wii U, we probably wouldn’t have the Switch as we know it. The trials and tribulations of Wii U formed the basis of this wonderful machine and without that transitional step, who knows what that successor might have looked like. While the idea worked in practice, you could only ever be a few feet away from your TV set with the Wii U Gamepad. Take one step into the next room, though, and things got tetchy. Over time, it became obvious this wasn’t the console people expected it to be, and inevitably developers accepted Wii U was less about playing HD marvels on a small screen, and more about second screen gaming expanding an experience. Wii U allowed you to have the menu and inventory screen in the palm of your hands at all times without pausing, all accessible via touchscreen. Effectively, it became a more expensive, HD driven 3DS, which almost seemed superfluous since people were downloading mobile apps on their phone to do the exact same thing with Xbox and PlayStation games anyway. Then Vita Remote Play happened which basically killed Wii U dead by taking the remote HD gaming idea one step further and doing it better. People could actually play Killzone and Infamous on the toilet now. Gamechanger! But with Switch, games are now portable anytime, anywhere, and your friends can even join whenever they want by picking up a JoyCon, something unfathomable on Wii U. 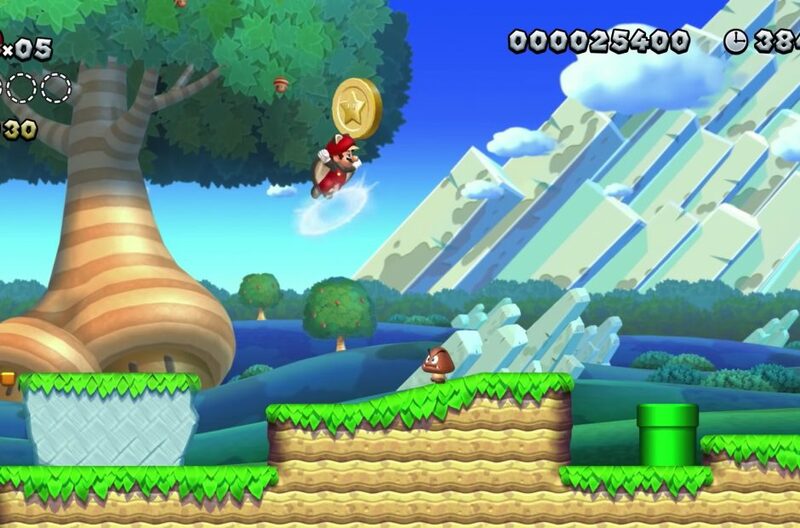 Make no mistake about it, this is how New Super Mario Bros U always should have been played. It’s only taken 6 and a bit years but Nintendo finally got there. So to some extent this feels like a brand new game. Even the HD textures have had an upgrade and the game looks better than ever with improved frame rate and resolution. It shines and sings on Switch, running smoother than ever before. True, it’s no drastic evolution over the original game, save for the new control options available to you with the Switch Pro Controller, and the individual JoyCons. 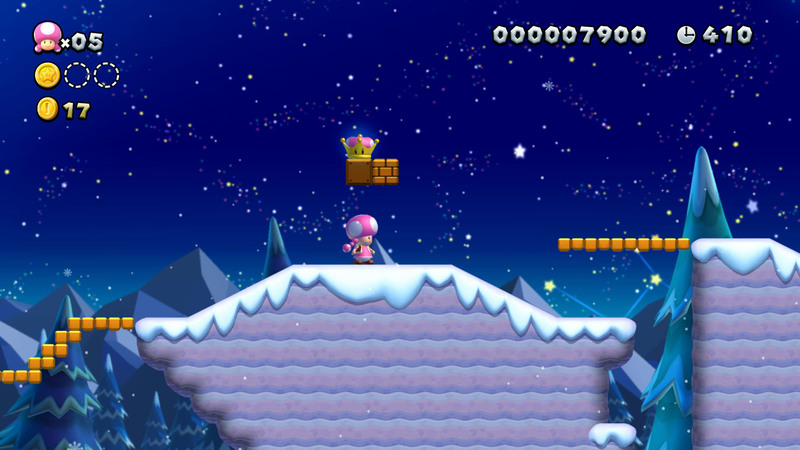 But the biggest change comes in the form of new characters Nabbit and Toadette, who make the experience easier than ever. This is an interesting design choice which we’ll elaborate on another time, but it certainly ties into the idea that Nintendo are opening up their core titles to all types of gamers, brought about by the likes of Pokemon Let’s Go. Of course, the fabled handheld mode is as incredible as you’d imagine and almost certainly the definitive way to play. To be honest, New Super Mario Bros U Deluxe just feels better suited in the palm of your hands as it lacks some of the sparkle and pizzaz of Mario Odyssey which glows radiantly on a 48″ . And with the games’ frantic multiplayer component, it fits Switch’s ethos like a glove. 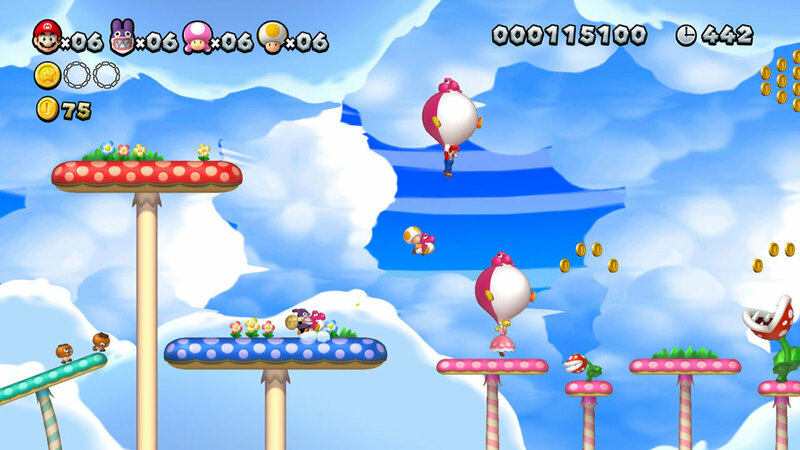 More than it ever did on Wii U.
Don’t get me wrong, I like blowing this up on the big screen to bounce on some Goombas and see some of the levels fleshed out in full, but it also reminds me why this never really set the Wii U launch library alight. To be blunt, it’s why Wii U owners felt starved of satisfaction until the excellent Super Mario 3D World came along. New Super Mario Bros U Deluxe is such a generous package now. It comes complete with all the New Super Luigi U DLC – which, in my opinion, is still the best DLC Nintendo has ever put together – offering 164 levels out of the box. Sometimes they can feel a bit repetitive, and strangely for a Mario game, a tad soulless, but there’s a ton of content here for you to get through and it will keep you busy, especially with the multiplayer modes. Maybe even until Yoshi’s Crafted World. No doubt about it, this game has found its true home on Switch and is already being played by more people than ever before. Like most games that have been brought over from the Wii U.
I’ll always have a soft spot for the system that gave me Rayman Legends, Wonderful 101, and Nintendo Land, but it’s become clear Nintendo is erasing the system’s legacy, one title at a time. Much like Tropical Freeze and Bayonetta 2, I can’t imagine ever wanting to revisit those games on the platform they originated on because it’s no longer the best way to play them. New Super Mario Brothers U Deluxe is naturally at home on Switch, the clearest sign yet that it needs the rest of Wii U’s extraordinary first-party lineup sooner rather than later. More people need to see what great games that system had before they’re forgotten to history, played by only a select few who bought into Nintendo’s original vision. Review code kindly provided by the publisher. Played on Nintendo Switch.